Quality management is not just an abstract term in our company but is part of daily life. All procedures relevant to quality are subject to a process of constant scrutiny and improvement. 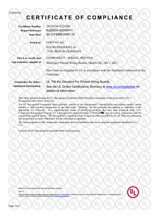 UL certification is the only standard accepted worldwide for the classification of flammability and the description of other product-specific characteristics. 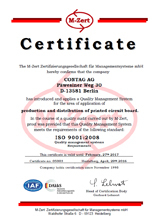 CONTAG was the first manufacturer of printed circuit boards in Germany to receive the VDE certificate, which, according to European guidelines and international procedures, certifies the introduction of a process management system to avoid hazardous materials. CONTAG is a registered user and, on customer request, will produce database entries for products (printed circuit boards).